In the 1850s and ‘60s Union Square was ringed by elegant brick and brownstone mansions. One of these, No 28 West 14th Street, was the home of Dr. Clarence Cameron. But only a decade after the end of the Civil War things had changed. Commerce had arrived on Union Square. By 1878 Dr. Cameron’s mansion had been converted for business purposes. And only three years later it was demolished by Joseph J. Little, a man with wide-flung interests. A partner in a printing firm that employed about 500 workers at the time, he had served as a first lieutenant in the war. He would go on to become President the Board of Education as well as a Congressman. And for now he was also investing in real estate development. In January 1881 Little’s architect, W. W. Smith filed plans for a new commercial building on the site. Smith had recently made his mark 14th Street, designing the five-story cast iron structure at Nos. 40 and 42 West 14th in 1878. 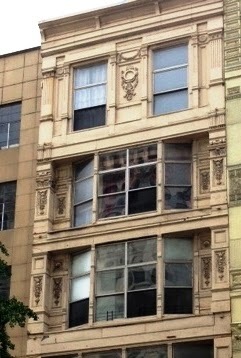 The $20,000, five-story building was faced in cast iron front--a material which facilitated expanses of glass. Smith creatively recessed the angled bays within the façade; permitting the building to step all the way up to the property line without the bays protruding into public space. Each story was decorated with ornate pilasters and panels, culminating in a highly attractive fifth floor where two openings were surrounded by wide and narrow pilasters and panels. It all made the simple cast iron cornice a bit of a letdown. Smith's careful attention to recessing the bays caused Joseph Little to bristle when James McCreery started construction simultaneously on his building next door at Nos 22 through 26 East 14th Street. McCreery's architects, D. & J. Jardine, applied to the Board of Aldermen for permission to include projecting bays. On May 28, 1881 the Mayor wrote to the Board, renouncing its resolution approving the request. He said that the owners of No. 28 and 30 "object strongly to the proposed bay-windows on the ground that they would injure their stores, which have been built with plain fronts." Little pointed out that it was McCreery who opposed their bay windows projecting over the property lines. Despite that political meeting, the building filled with artists who both lived and worked in their studios. They were drawn by the northern light, unobstructed due to the Square, which flooded in through the wide windows. At ground level was the piano store of Jeremiah M. Pelton. 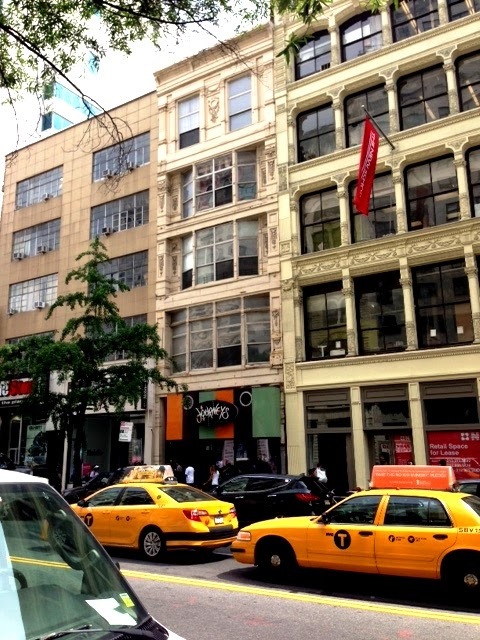 At the time the 14th Street and Union Square area was becoming the center of the piano district. Steinway & Sons had erected their building at No. 109 East 14th Street years earlier, and other makers and dealers like Sohmer and Decker would join the trend. For 15 years Pelton had been a partner in the organ manufacturing firm of Peloubet, Pelton & Co. When the company dissolved in 1880 he went into business alone. The New York Times called him in 1885 “one of the oldest men in the business.” But trouble came to Jeremiah M. Pelton that same year. He had amassed a personal fortune of about $50,000—a considerable $1.27 million today. But, as The Times noted on May 10, “he has invested considerable money in a Western mine.” Pelton over-speculated and was forced into bankruptcy. When police arrested Parsons he had already pawned the jewelry for $100. The unlucky Jacob Venter had lost his jewelry and still had no job. What became of W. J. Johnston & Co.’s bank note is unclear. Another artist in No. 28 East 14th Street at the time was the Irish-American still life painter William Michael Harnett. 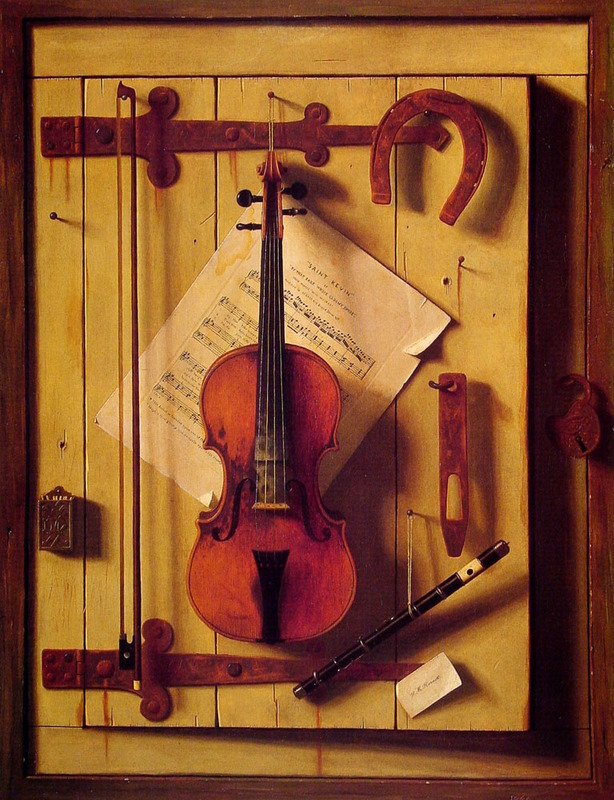 His meticulously-executed trompe-l’oeil paintings were nearly photographic in their detail. He worked and lived here from 1886 through 1889. A rather unexpected tenant took the ground floor shop where Jeremiah Pelton had sold pianos. On January 26, 1885 J. J. Little signed a lease with Mark M. Stanfield and his son, George O. Stanfield, partners in George O. Stanfield & Co. According to Little later, “They went in under that lease and conducted the retail rubber business there.” The firm failed in 1888 and was immediately replaced by Para Rubber, another retail “rubber goods” store. The third floor had been occupied not by artists, but by two small businesses, both now gone. The Barr Cash and Package Company, which had recently moved next door to No. 30, and the Mosely Novelty Company, had moved out two months earlier. The World noted “The top floor is occupied entirely by artists who sleep in the building, and the fourth floor is taken up by studios and the apartments of the janitor, Lee Blair. Blair arose and began his usual morning rounds at 5:15. He noticed smoke coming over the transom of a room on the third floor. When he entered, he found a stack of clothing—an old pair of trousers, a woman’s skirt and a hat—on fire in a corner. He rushed to the corner and pulled the fire alarm box; and then ran back to dump several pails of water on the fire. By the time the fire department arrived, he had nearly extinguished the blaze. Investigation revealed that a hole had been chopped into the wall and several burnt matches were strewn about the floor. The laths in the wall were scorched; showing that an attempt had been made to set the wall on fire. When that was unsuccessful, the arsonist had set fire to the old clothes. As the century drew to a close Union Square was a major shopping area. Businesses shared space in the building with the artists. The Parisian Suit and Cloak Company was here by 1896, and by the turn of the century Emile E. Jeantet, Edward E. Jeantet and Eugenie R. Jeantet, ran their importing and manufacturing business, E. Jeantet, here. They offered “Large and select stock of everything needed by the Hair trade. F. Frank was self-employed, manufacturing chairs by himself in an upstairs room by 1903. Over the years several of the tenants would bring unusual and unwanted publicity to the building. One of these was artist Mrs. Jeanne Ogden who rented a studio in 1908. The Sun noted that she “is said to have been a footlight favorite in London concert halls years ago.” But something happened on November 20 that year. Other tenants in the building noticed that Jeanne had been acting strangely for several weeks. It culminated on the morning of November 20 when she walked up to Policeman Hand nearby at 14th Street and University Place and asked him if he felt a shock. The bewildered policeman said he did not. Another tenant, Leo O’Brien, had a run in with the law as well. On October 7, 1923 police staged a city-wide raid of more than a dozen restaurants, cabarets and other businesses suspected of violating the Volstead Act. Leo O’Brien was in the wrong place at the wrong time. Following a ground floor renovation in 1948, the upper floors remained vacant for decades as the Union Square neighborhood suffered neglect. But, like most everything in Manhattan, that would eventually change. Not only was the neighborhood revitalized as the 20th century drew to a close; so was No. 28 East 14th Street. A “mixed-use” property, it was purchased in 2000 by Ultimate Realty and resold in March 2015 for a staggering $30 million—an enviable profit. 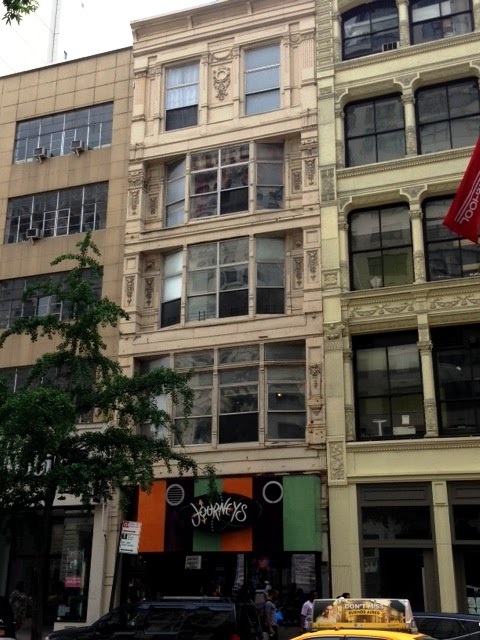 Although the store front has been obliterated (hints of the cast iron pilasters survive); W. W. Smith’s unusual cast iron structure is essentially intact above street level. "The Jew's soft hands and curved fingers grasp only the values that others have produced. Wherever the Jew is allowed to establish himself, dishonesty takes the place of honesty; immorality, of virtue; disease, of health; sluttishness, of cleanliness; anarchy, of order." This book makes Hitler's views on Jews seem mild. It can be viewed at archive.com. Timayenis wanted to start a monthly magazine called The Anti-Semite. Timayenis wrote, "The periodical we propose to establish, will give a faithful account of the deceits, crimes, and fraudulent transactions of the Jew, in all channels of business." The magazine never got off the ground. In 1893 Timayenis was sued for swindling an investor P.N Ramsey. Timayenis died in 1918.